Help-wanted signs are popping up all over Maine, as they typically do this time of year. But job recruiters say Maine’s low unemployment rate combined with a record tourism season last year, an aging workforce and a cap on certain types of foreign workers are making the labor gap more challenging than ever for some employers. And it’s not just seasonal workers who are in demand. School bus drivers are always tough to find. But Ashley Reynolds of Hudson Bus Lines says this year she’s got about half the number she needs in her Lewiston and Auburn terminals. 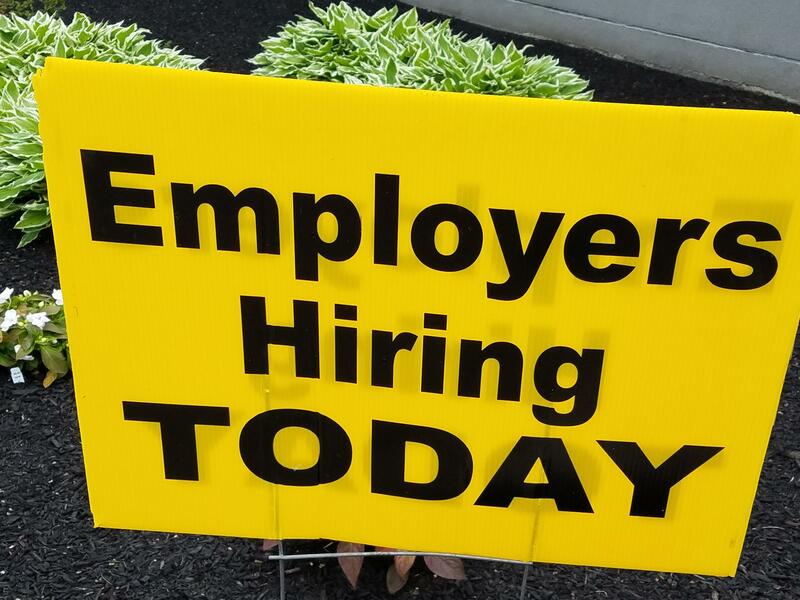 A sign outside the Lewiston Career Center, which hosted a job fair Monday. Some people may be put off by the part-time hours. Others just find the job intimidating. “Today we got somebody that said, ‘Oh, it’s a school bus. So it’s a big, huge school bus, so it’s a lot of kids and a lot of responsibility.’ So I think that’s a majority of it,” she says. Reynolds was at a job fair at the Lewiston Career Center Monday morning trying to recruit as many people as she can. She says driving a school bus is a good job for someone who’s retired or who wants to supplement their income. Starting pay is negotiable. And the company offers paid training to qualified candidates, who must have spotless criminal and driving records. That’s also one of the criteria to work at Black Bear Support Services, a family-run agency that works with people with developmental delays, and has clients throughout Androscoggin County. “We’re looking for staff who are passionate in this field but may not have the training yet. We can train anyone,” says Shay Long. Long says the turnover rate for her company is high, so the need for good, caring workers never lets up. 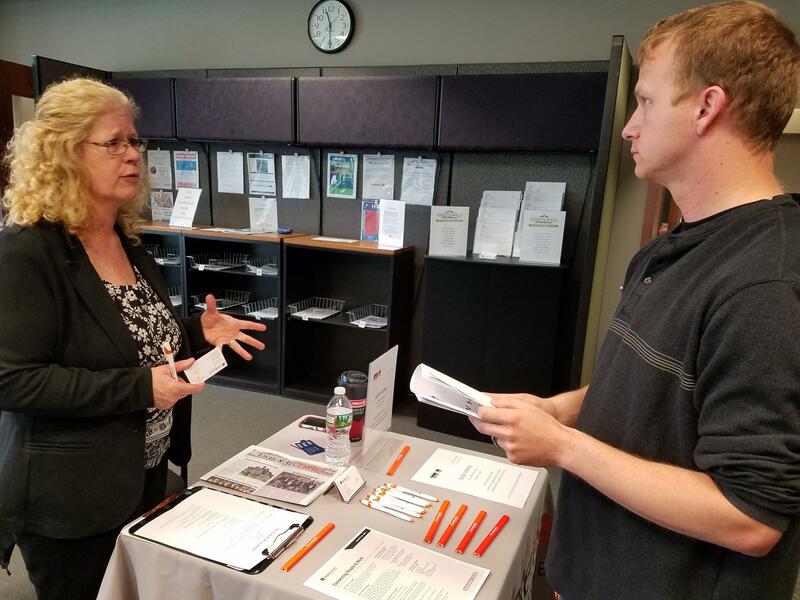 Lisa Mottram of People Ready talks to job applicant Matthew Leavitt of Auburn. Applicants must also have a high school diploma and a vehicle. If someone has one speeding ticket, Long says the company will pay for a drivers’ training course, but anything more than that is likely a disqualifier. “I know a lot of people may not have criminal records that are above and beyond and I understand that but, unfortunately, due to the circumstances of our employment we do have to watch out for that,” she says. Recently, Gov. Paul LePage announced that he was commuting the sentences of 17 male prisoners considered low-risk offenders as a way to address the labor shortage. The governor said he would also look to release early some female prisoners and possibly some in Maine’s county jails. Pamela Holt, a recruiter with the temporary employment company At Work Personnel, says she appreciates the governor’s action. She says her company is in desperate need for general laborers and construction flaggers statewide. “Our company is turning contractors away because we don’t have enough staff to staff them,” she says. And unlike some employers who need to be cautious about hiring someone with a criminal record, Holt says her company is more flexible. 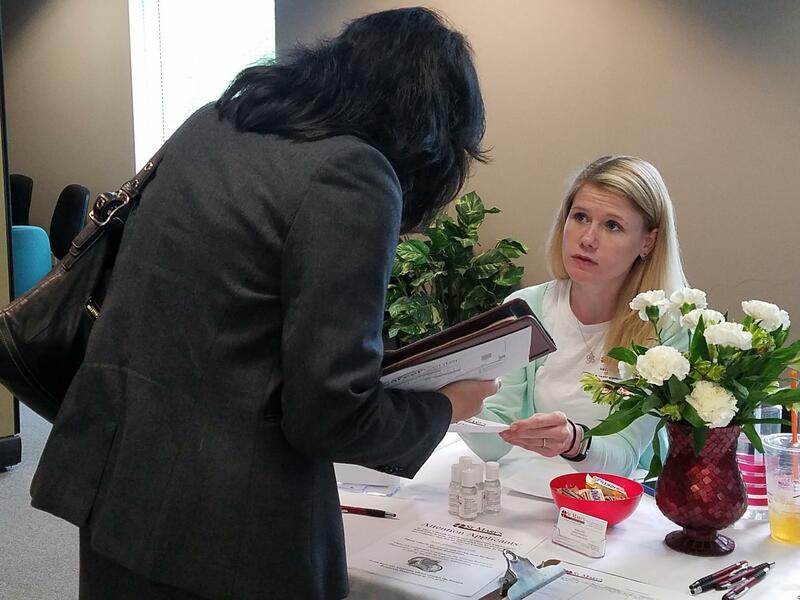 Brittany Blais, a recruiter for St. Mary's Hospital, talks to an interested applicant at a job fair in Lewiston Monday. “It’s a case by case situation but, yes, we are definitely willing to look into it and possibly hire,” she says. Ditto for the Lewiston-based staffing agency known as People Ready. “We are considered a second-chance employer. We do have some positions that require background checks, but we have many that don’t,” says recruiter Lisa Mottram. Mottram says she’s looking for people to fill everything from janitors to skilled carpenters and everything in between. And she says she has a serious need for them statewide. “It’s grave. We need a lot of people. We’re really, really busy and we have to be really creative to get people,” she says. Being creative, she says, requires reaching out to new immigrants and to older adults. Julie Rabinowitz of the Maine Department of Labor says employers are also learning that to attract and retain workers they need to make them happy. 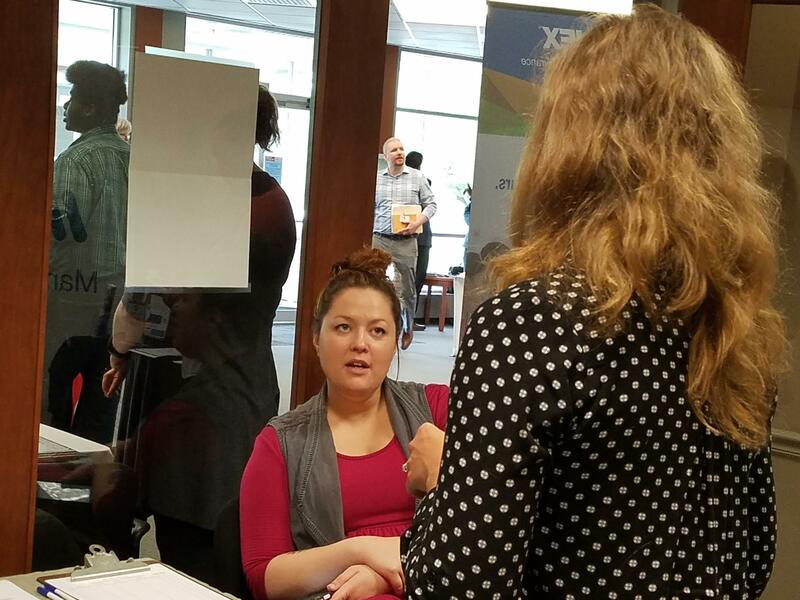 Shay Long (left) of Black Bear Support Services speaks to an interested applicant at a job fair in Lewiston Monday. “Whatever benefits you can provide to your worker that gives them the competitive edge, whether it’s a shorter commute, better pay, flexible work schedules — all those things are really important,” she says. Rabinowitz says Maine had a statewide unemployment rate of 3 percent in April, its lowest rate since 1976. And while she says that’s good news, she says the Labor Department is increasing the number of job fairs it holds and working with adult ed and local general assistance offices to help reach people who are in need of work.